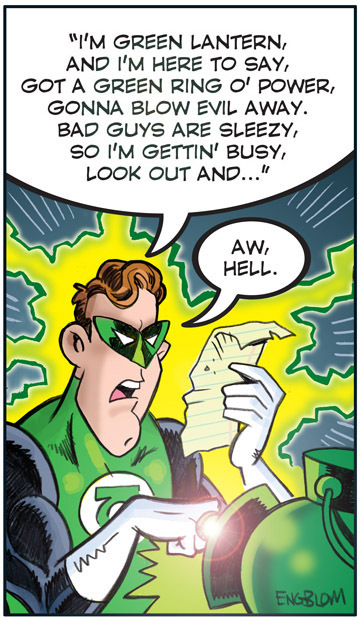 recites each time he recharges his power ring? Don't forget to take a shot at the Great Superman Beat-Down Contest! the most correct guesses will win a Superman: Doomsday DVD! One of my favorite comic book concepts has always been Captain Marvel and the power of SHAZAM. A clever synthesis of modern and ancient mythology, the story of Captain Marvel began in Whiz Comics #2 (1940) as orphan Billy Batson was drawn to a mysterious underground chamber. He was met by SHAZAM, a wizard who could channel the power of ancient heroes...all of whom were inscribed as a handy acronym on a nearby wall. Speaking the wizard's name, Billy was magically transformed into the superhero Captain Marvel, who also possessed the abilities of Solomon, Hercules, Atlas, Zeus, Achilles, and Mercury. SHAZAM: The Art of the Deal! Comics Behind the Comics: It's Clobberin' Time! Of all the renowned superhero catch phrases, one of the biggies belongs to Ben Grimm, a.k.a. The Thing of the Fantastic Four. First shouted out as he charged into battle way back in Fantastic Four #22 (1964), "It's Clobberin' Time" has been Ben's tried and true war cry ever since. However, did "It's Clobberin' Time" just kinda happen...or did Ben Grimm try (and reject) a number of different phrases before landing on that famous phrase? * from Hanna-Barbera's wretched "Fred and Barney Meet the Thing"